Originally published by the Duke Nicholas School. Many of us must be involved in some aspect of fundraising as part of our job responsibilities, be it grant applications, content generation, or direct contact with individual donors. I’m no different, and as a result I always keep my eyes out for new and innovate fundraising strategies. I have made small donations to a few environmental organizations, and I know they sell or trade my address among themselves. Fortunately or unfortunately, this is a common practice for nonprofits, and it has certainly given me a stack of 2017 calendars from organizations across the country. However, it has also made me immune to the usual “gifts” that come with donation solicitations, including address stickers and the aforementioned calendars. Going to my mailbox over the weekend, however, I pulled out a medium-sized envelope from the Yellowstone Park Foundation. Heavier than usual, I opened the package on my way back inside, revealing a music CD with nine complete songs. Intrigued, I placed it in the front seat of my car, ready for my morning commute. I detest driving to work. There’s only one road that can take me between the intracoastal waterway and Eglin Air Force Base, and it is always clogged with traffic. Instead of dealing with radio morning shows, I slipped the CD into its little slot, and suddenly the sounds of Yellowstone washed over me. Behind the beautiful orchestral music I heard the calls of loons and cranes, the bugling of elk, the rushing of river water. I felt calmed, absorbed in the natural soundscape staff had spent hours recording. In short, I loved it. 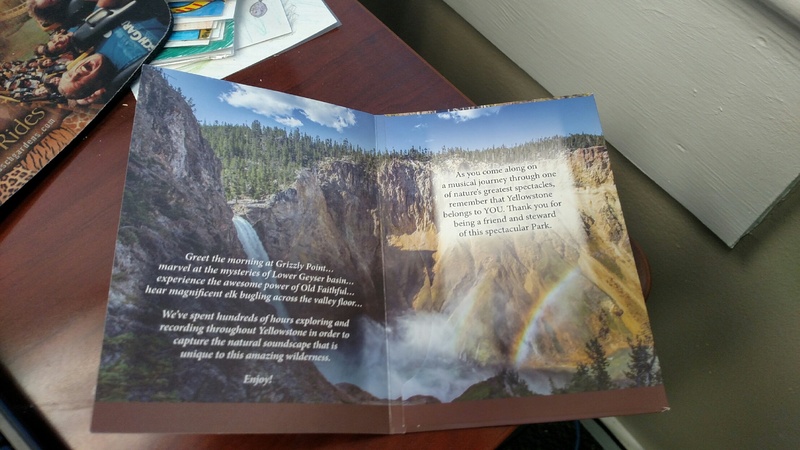 Before the envelope arrived, I had never heard of the Yellowstone Park Foundation. Yet, within 12 hours of playing the CD for the first time I had given my first small donation. Now that is an effective donor strategy. To my fellow colleagues: we should think of similar ways to engage people not only with our organizations, but also to ecosystems in general. Music can connect donors, visitors, and citizen-scientists alike. Next Next post: Celebrating our First Anniversary!